The low probability of detection is noted as major problem of non destructive testing - this evened due to techniques which have high attainable flaw sensitivity such as conventional ultrasonic inspection, and is mainly due to the human factors . The ISONIC system - introduced a few years ago to close this gap [2 - 11] - can at last ensure the validity of manual ultrasonic inspection. Based on the unique experience learned from field operations, today's rugged portable battery operated ISONIC workstation with internal ultrasonic flaw detector PC card covers almost the whole range of weld inspection tasks and requirements through an extremely wide arsenal of application software. In addition the operator can create, store and recall any individual color scale. Some reflectors return direct echo accompanied with satellite pulses, which are easily recognized and not imaged separately if using correlation data analysis. However, numerous standards and inspection proceedings require raw data imaging, so both options are provided as illustrated above. Another opportunity for capturing and storing raw data achieved through running TOFD software package, which - for the first time - allows to obtain TOFD map while mechanics-free manipulating pair of probes along or across the weld without relocating the positioning system. An example of printout of the TOFD map obtained and reconstructed A-Scan in the operator's selected section of the weld presented. 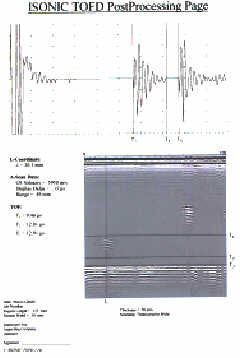 Initially, ISONIC was introduced as a PC-based recorder add-on to the standard ultrasonic flaw detector. 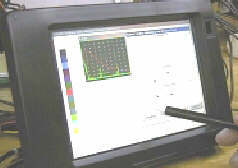 The rugged industrial PC was used for field operation. Today's new generation ISONIC workstation is based on the use of the internal flaw detector PC card, for example USLT 2000. The new portable battery-operated host with sun-readable true-color touch screen allows the reduction of ISONIC dimensions and weight making it compatible with conventional ultrasonic flaw detector. Today's ISONIC workstation can be equipped with new option for the first time allowing the transfer of A-Scans, defect images, testing performance data and instrument settings from the inspection site to the office PC, in real time via the Internet. The operator working on site (usually - level II) can now demonstrate dynamically the changing screen of his instrument to his colleague and/or boss (usually - level III) sitting at a remote site in the office and ask for a second opinion whilst actually performing the inspection and making decisions. This breakthrough enables the office PC and the on-site instrument to capture and record ultrasonic data simultaneously.To implement this option, the ISONIC workstation must be additionally equipped with a standard communication card either for mobile phone or telephone or local network and with the ISONIC Internet TV software package. The office PC must be connected to the Internet or to a local network and equipped with the same software. One office PC can collect and record data from few simultaneously working ISONICs.